Today was a long day of eating as I travelled around New Jersey, trying out some of the food made famous by the Travel Channel and The Food Network. The first stop was a restaurant called Stuff Yer Face, that is known for making gigantic 18 inch strombolis. Stuff Yer Face offers their own delicious iteration of the nacho, known as the Potacho, which are basically nachos made with thick cut potato chips as opposed to corn chips. The potachos were delicious, heavily topped, and perfect as a starter or as finger food for a sporting event. While the potachos were fantastic, I came to this location in order to try the stromboli. The strombolis were very large, and the sauce and toppings were extremely tasty. The sauce used in these strombolis is a special recipe that has a bit of a sweet taste to it, and the toppings are generously spread about the roll. I really enjoyed the Stromboli but if I had to nitpick I’d say the dough was a bit lacking in flavor, while the toppings and sauce more than made up for the dough, the few topping less bites I encountered had to be powered through. The next place I went to was Carlo’s Bake Shop in Hoboken, made famous from The Cake Boss television show. This shop boasts a full array of cakes and brownies, as well as fancy designer cakes for special events. Carlo’s Bake shop gets a lot of hype due to the television show, but this bakery reminds me of many other Italian bakeries similar to the ones I can find around The Bronx. There are many good bakeries that a similar to Carlo’s but they just don’t get as much notoriety. The thing I really love about Carlo’s Bake Shop is their prices, they are extremely reasonable considering the popularity of the shop, even though it is famous the prices make this bake shop feel like an everyday neighborhood bakery. I would definitely recommend both of these locations to any foodie with a mode of transportation and a desire to try some interesting foods of New Jersey. I spotted many interesting eateries around New Jersey, I definitely will be back to sample everything, but in smaller portions. Everyone has critics in life, and people who decide to honestly air their opinions rarely use a filter. I am all for criticism, since it means others are taking notice to what I am doing, but I commonly hear people asking only for “constructive criticism.” Constructive criticism is a form of criticism, which is meant to bring about an improvement in a product. I understand many people don’t want their “feelings” hurt, so they would rather not receive general criticism, but all criticism can be constructive if the opinions expressed are taken into account and used to better a product or work of art. Criticism by definition, is judging the merits and faults of something in an articulate way, so if a “critic” is baselessly badgering something, then their words are not true criticism. I guess the issue today is the fact that everyone is a critic, yet everyone does not know how to properly criticize. I am not trying to say speaking negativity is fine if done intelligently, but when an opinion is well stated it can be well received, even by those who disagree with it. I think everyone should be more receptive to true criticism, and more eager to produce it. In this age of Internet reviews, criticism has been relegated to hate it or love it responses, there is no longer any form of true criticism so people do not know how to approach it. Learning to accept criticism is extremely important, whether it is to address a problem with a work, or to continue on with a work in spite of doubters. I do not know what the future holds for critics, hopefully the Internet does not completely kill the art of critiquing. A skill is the ability to perform a task, skills can be learned or taught and they go a long way in forming who we are as people. As a child it seemed liked learning skills was easy or necessary, whenever I was taught something, I just learned it, giving little thought to the task at hand. During adulthood, skills are perhaps more beneficial, but even the most simple of tasks can seem like a chore to learn. There is a common phrase that goes “you can’t teach an old dog new tricks,” and that seems to go for some humans as well. I would never say adults can not learn new skills, since some of my most cherished skills were learned in adulthood, but it is possible that much like a dog, humans carry a certain level of stubbornness when it comes to learning. I enjoy learning, I learn things pretty quickly, but I have to admit I usually procrastinate heavily when it comes to teaching myself a new skill. When I think about it, it seems like the older a person gets, the harder it is to teach them new skills. I have tried teaching elderly individuals how to use smartphones and I can attest to the difficulty they face grasping even the most basic of concepts. While it does take longer to grasp new skills with age, a major factor in learning as you get older is interest. If you are truly interested in learning a new skill then you will put in the extra effort necessary to fully grasp it. Learning and developing new skills is extremely important, not only can the skills learned save a life, but learning new skills can keep you alive. The human brain is like a muscle, if it is stagnant for too long it can lose its potency. Try and teach yourself a new skill every once in a while, it is better to take 5 years to learn a new skill than to let your brain go to waste. Day 55: No Technology? No Problem. It is amazing to consider the fact that humans have lasted so long on this planet. Often times we look at luxuries of life as items we “could not live without” but considering the many people, even in this era, who live without these things, it is easy to distinguish these luxury items from those of necessity. I recently watched a 60 minutes report by the late Bob Simon, about the Moken people of Burma. These people have survived for centuries without the help of modern technology or even the modern advancements in medicine that many people in first world regions currently need. These people fully learned to live off of their land, they have adapted perfectly to swimming and spear fishing, and can be considered almost superhuman for their underwater endurance. The report centered on how the Moken people were able to survive the devastating Indian Ocean tsunami of 2004 by following signs they recognized and legends they’ve heard. The people noticed the water receding several hundred yards, then began to make their way to higher ground, warning others of the danger as they fled. The Moken people are a perfect example of human resilience, I have said in in a previous blog that humans are some incredible beings, but these people are showing they can thrive in any condition, all without the help of modern technology. If the Moken had our modern technology, and were busy using mobile phones or televisions, perhaps they would never have noticed the signs, they would have all been wiped out essentially due to technology. The longevity of the Moken people shows that technology may not be as necessary as we think, and perhaps if it were not so intertwined with our everyday lives, all humans would be more powerful and perceptive. The New York Yankees have officially lost it. The Yankees where once a baseball franchise that struck fear into the hearts of their opponents, along with their massive payroll the Yankees were once a powerhouse of “purchased” talent. In recent years the Yankees have decided to try and build the team from their minor league talent, a tactic that has yielded some promising talent but very little promise. The Yankees were once the team everyone loved to hate, they would sign the best talent for the most money and win championships, but since the passing of owner George Steinbrenner, the team has lost much more than just its CEO. Under the leadership of “The Boss,” as Steinbrenner was affectionately known, the Yankees had a certain moxie about them, fans hated them, players hated them, but when given a chance to wear the pinstripes those players quickly conformed to the Yankee way. There was a time in the late 90s when the Yankees had the ability and the bankroll to sign any player, today the Yankees failed to sign a much needed prospect, even worse is the fact that they allowed their mortal enemy and eternal rival, The Boston Red Socks to sign the highly talented Yoan Moncada. The Yankees have been known as “The Evil Empire” for years, as a nod to the Star Wars franchise, but today it has become increasingly apparent that there has been a shift in the force, and it looks like the Yankees are going to need much more than Luke Skywalker to regain the balance. I am a Yankee fan so I am not exactly cheery about their current condition, I guess I can do as all Yankee fans have done for years, rest confidently on our laurels, and thank God that we are not Mets fans. A lie is a false statement that is intentionally told to mislead others. Lies can also be done in actions and deeds, but generally speaking lies are spoken. When I think about the lies I have heard throughout my life I like to wonder, why do people even lie? I guess the best way to answer that question is to look back at my own life and see when I have lied for whatever reason. There have been times I told lies in order to keep others safe or in order to spare the feelings of others, but truthfully most of the lies I have told were completely for selfish reasons. I have told lies in order to have people see me in a different light, and I have even at times lied to keep certain things away from people. I believe lying is wrong, but everyone at some point in life has lied, and perhaps their reason for lying was much better than the consequences of the truth in their mind. I understand that everyone, including myself, has told a lie, but I find it annoying when I speak with chronic pathological liars. I have worked with and communicated with many individuals that have embedded lies so deeply into their daily conversations that I cannot even believe the simple statements they make. When people lie they are trying to hide the truth, but once a lie is found out all trust is lost, and every statement draws skepticism. There are many reasons people lie, but it is just better to stay quiet, or to tell the truth and take the consequences. It is not worth it to get the momentary satisfaction of a lie, at the risk of the trust of those you care about. What exactly has become of growing up? This generation has totally skewed what it means to be an adult, and perhaps it has actually crept into past generations. I ask the question because I have noticed an increasing amount of older people dressing and acting way too young for their age. When I say older people I am not referring to thirty year olds acting like they are in their twenties, but to fifty and sixty year olds acting almost like teenagers. I can not fully vouch for the past since all I know about it is what movies and my parents tell me, but it doesn’t seem like the older generations were so enamored with the pop culture of the time. In the 1960s people who went along with pop culture were considered “hippies,” and by in large scorned by the older generation, yet today I see older individuals trying to emulate today’s “hippy” who is in the form of a “hipster” or “thug.” Maybe I am too young to understand a desire to harken back to the days of my youth, but I already have a dislike for some of the trends of kids these days. Perhaps life is just cyclical, and in 40 years millennials like myself will be as disillusioned with the actions of the youth as “the silent generation” was with the actions of the “baby boomers” of the 60s, or maybe the next generation’s creativity will be less social and more scientific, demanding our time and attention. All I can plainly see is that, this generation has turned growing up into the next generation’s problem. I love growing at my own pace, and as crazy as this planet is, I understand social change needs to happen, but I feel like the current dominant generation is doing too much to shine a light on what needs to be changed and too little to make a change. The kids who are growing up today are going to have a laundry list of social and environmental issues they must tackle since today most people are just too busy tweeting about what needs to be done. I don’t want to bash millennials because I feel like we are a great, very progressive, generation, but I would love to see more older people getting into the habit of making change in the world. The world isn’t getting any younger, so I hope this generation will start to embrace getting older, I for one will do everything I can to make sure I am a respectable elder with knowledge to share, and not a sixty year old man, dressed like a kid, trying to get into a future club to hear robot music. Candlelight Inn is a cozy eatery tucked away on the bustling Central Avenue of Scarsdale, New York. After hearing about the famous Candlelight wings for years I finally got the chance to stop in and give them a try. The first thing I noticed about candlelight is the amount of space, the restaurant are is small, seating only about 30 patrons, but that hasn’t kept it from being wildly popular in this part of New York. This restaurant is always busy, I was lucky enough to be able to grab a spot inside since I was in the area just as they opened their doors today, and I was well rewarded with some great eats. The menu of candlelight is quite extensive, featuring many classic American dishes as well as some Italian favorites, and while I was impressed by the menu I was there for one thing, the wings. Candlelight Inn handles wings a bit differently than most eateries I have been to, while most restaurants serve half wings, candlelight serves full wings, fried and doused in a delicious sauce. I tried their mild wings, which were great, I also tried their teriyaki/buffalo mix wings and I was blown away by the unique flavor. The teriyaki and buffalo mix was almost like a glaze, it was a perfect marriage of flavors that was quite mild and tasty, I would definitely recommend it to anyone who enjoys teriyaki but doesn’t want too much of an overpowered flavor. 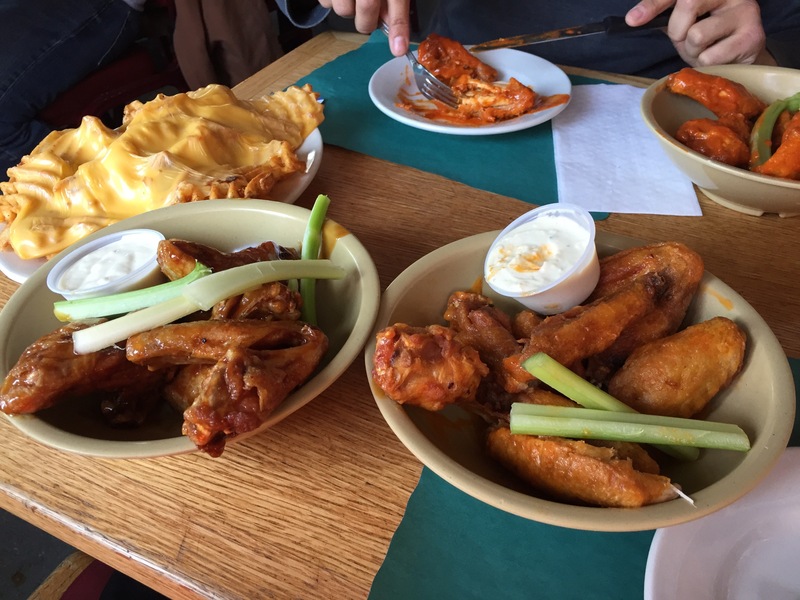 Candlelight Inn is a restaurant that is perfect for anybody craving wings in the Bronx or Yonkers area, the wings are crispy and tasty, and overall a much more rewarding meal than chain restaurants such as Buffalo Wild Wings. Candlelight Inn is a small restaurant, so if you find yourself in the area prepare for a bit of a wait, but trust me it is well worth it for the wings. I have always had an affinity for Roman numerals. Growing up as a child I was a student who enjoyed getting ahead of the class, and when I learned about Roman numerals I just had to do more exploration. I have always enjoyed the look and progression of Roman numerals, it’s amazing that they are still used today in many mediums. Today is the 50th day of my blog and “L” is the symbol for the Roman numeral fifty. L is the symbol for a loss or a loser in modern times, but the number fifty has much more significance than its Roman numeral counterpart. The number fifty is very significant when it comes to milestones, for instance it is considered the golden anniversary in weddings, fifty years of marriage is no small feat considering the divorce rate in this county. Fifty also marks a “golden” number and gold is a symbol of prestige, a far cry from what “L” denotes in modern times. When I think about the number fifty I consider it as halfway to completion, percentage wise, and it is also considered the midway point of life. While fifty may be halfway to completion, I am not even close to being done with this blog. I have gone over many different topics, but I am still not close to my goal of 365. I usually don’t get this far into many of my blogs, but I hope keep this one going well beyond the set goal, thanks for reading.